Many of today’s firefighters are now equipped with a NFPA 1983 rated Class II rescue harness. 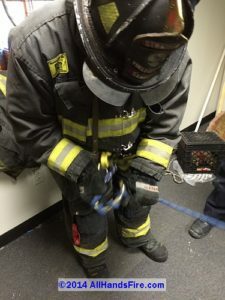 Harnesses have become an essential tool for firefighters, facilitating the use of a Personal Escape System, use with various firefighter rescue maneuvers, positioning when working at height, and more. NFPA 1983, 3.3.40 defines a Life Safety Harness as, “An equipment item; an arrangement of materials secured about the body used to support a person”. One of the most common Class II harnesses available is the Gemtor Harness. This fire-rescue harness is designed with a waist belt, leg straps, an A-frame, and a Pompier Hook (extra-large carabiner). This configuration affords the user many options and uses. It is also UL tested and certified to NFPA 1983: Standards on Life Safety Rope and Equipment for Emergency Services. In 1982, the Gemtor model #541 harness was introduced. It was invented by FDNY Lieutenant Rich Murray and had a patented design to lower a firefighter’s center of gravity, preventing unintentional inversion. At the time, it was designed predominantly for picking off victims from height. The Gemtor Harness replaced the “Atlas Belt”. In 2001 the 541 harness was redesigned with improved stitching and a new steel auto-locking Pompier Hook to meet OSHA and NFPA standards. In 2006 a third generation harness was designed and named the 541NYC. This harness featured an aluminum 3-stage Pompier Hook, a sliding D-ring for the addition of an escape system, was lighter in weight, and had redesigned stitching for increased strength and a new design for stowing the Pompier Hook. The Gemtor Harness is constructed of MIL-W-27265 spec nylon. Harnesses are generally constructed of nylon and Kevlar. There are considerations for each material when choosing a harness that best suits your needs. A misconception is that wearing a nylon harness externally will cause damage. The nylon material used can withstand temperatures of over 400-degrees. In addition, the Gemtor Harnesses used in the New York City Fire Department since the 1980’s are proof that its rugged design holds up under extreme conditions. 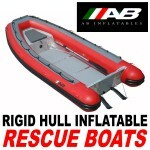 There have been no reported incidents of snags, melting or faults. 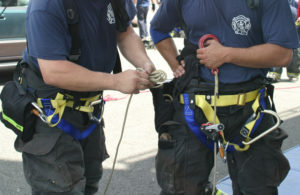 Nylon webbing in harnesses will offer stretch, which reduces the shock that the human body will absorb when the harness is loaded (or shock loaded). Elongation at break percentage for nylon is 17% to 45%, as opposed Kevlar that is 2.4% to 3.6%. Kevlar has no stretch, therefore no energy absorption. So when loading (or shock loading), the human body will absorb the full impact. Nylon is a softer materials and does not wear out other materials it comes in contact with. Kevlar is a very abrasive material and can cause wear to other materials. Kevlar fibers tend to break from the inside out. This makes it hard to inspect and identify wear and deterioration. UV from direct sunlight affects nylon and Kevlar differently. With nylon, prolonged exposure can cause deterioration. With Kevlar it will degrade the fibers when exposed to sunlight. Nylon loses strength progressively and recovers from heat exposure. Kevlar does not recover and decomposes when exposed to extreme heat. The Gemtor Harness is designed as an external harness. When talking about placement of harnesses on turnout gear, being an internal or external arrangement, this also has points to be considered. Harnesses should be inspected before and after each use. With an external harness this can easily be accomplished. With an internal harness this would require the dismantling of turnout pants, the separation of liners and in some cases, the removal of the harness to accomplish the inspection. An internal harness, especially one with Kevlar material, can cause untimely wear of the internal liners and protections of a user’s turnout pants due to its abrasive texture. Most newer-style “internal” harnesses have a large portion that is external. An external harness provides “grab points”. This is incredibly beneficial for firefighters conducting a rescue of a downed firefighter, and their ability to grab, move and remove the victim from untenable conditions. Internal harnesses are concealed and offer no grab points for horizontal movement of a downed firefighter. Internal harnesses are difficult to adjust. So in many cases they are improperly worn and are loose on the user. 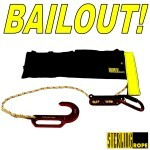 This can have multiple inadvertent affects to the user such as, extending the A-frame farther away from the user making it difficult to reach and actuate an escape system descender, and when loading the harness having an improper and loose fit outside on manufacturer recommendations. External harnesses are much easier to access and adjust. The construction of the A-frame on many of the internal harnesses are too long. When using an escape system, this places the descender farther away from the user making it difficult to reach and actuate the device. Along with being extremely useful and durable, the Gemtor Harness is also incredible strong. Static pull tests performed on the harness have recorded strengths of over 11,000 lbs. The harness is rated for a 600 lb. load. The strength of nylon webbing is 9,800 lbs. 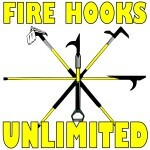 The Pompier Hook is rated at 9,000 lbs. With regards to the harness life expectancy, Gemtor’s current policy is that product life is based solely on the condition based on inspections performed by the user and periodic inspection by a competent person. Inspections should be performed periodically according to the manufacturer’s inspection procedure, which is stated in OSHA standards and NFPA 1983, section 5.9.2.2(1). Current ANSI and OSHA standards do not reference any specific amount of time for service life. It instead refers to “the manufacturer’s specified service life” as one factor used as a condition for removal of service. Harnesses subjected to an actual fall arrest or impact forces must be immediately removed from service and destroyed. Any items showing excessive wear or deterioration shall be destroyed. Inspect all equipment before each use. 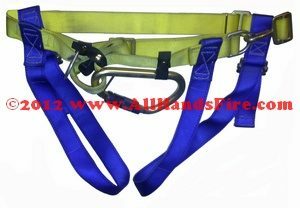 For additional information on the Gemtor Harness or to purchase or receive training, please contact Training@AllHandsFire.com and also visit www.AllHandsFire.com and www.AllHandsFireTraining.com.